PT Online operates a platform that suggests workouts and exercises tailored to users’ exercise ability and goals, and provides guidance and instructional videos for completing exercises, as well as general tips for healthy eating, which we make available through the PT Online application available for download on your mobile device (the “PT Online App“) and our website at www.ptonline.app (the “PT Online Service“). The PT Online Service is provided by Personal Trainer Nordic Online AB (“PT Online“, “we“, “our“, or “us“). 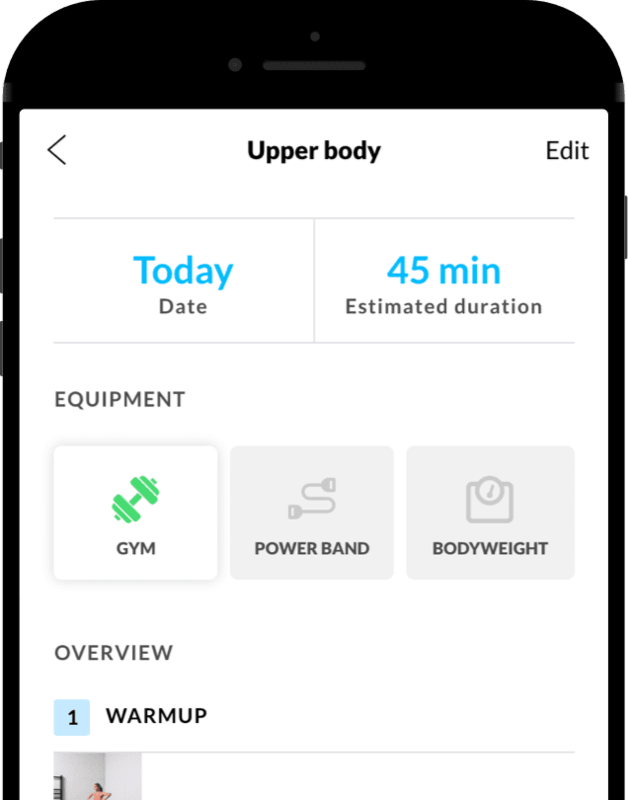 Most of the content provided to you through the PT Online Service is generated automatically by our workout generator software in response to your responses to specific questions. It is customised to you based on your answers to those questions and, over time, will further adapt to you based on your use of the PT Online Service. The content provided to you through the PT Online Service is not, however, manually tailored to you personally. Any extra sessions added by you through the “Add Session” functionality on the PT Online Service may also suggest variations that may be more suitable to your goals and ability, but will not be customised for you. The content provided through the PT Online Service may therefore not be appropriate to your specific circumstances. In particular, you should seek advice from a doctor before doing any of the exercises or following any nutritional guidance provided through the PT Online Service if you have a medical condition or injury that might be impaired or aggravated by exercise or if you have any specific nutritional requirements or allergies. If at any time during your workout you do not feel well, you should stop immediately and, if required, seek medical advice from a medical professional. The PT Online Service offers guidance on completing certain exercises safely and effectively. However, you are responsible for ensuring that you do the exercises in accordance with the guidance we provide to you, and for otherwise ensuring that you do any exercises safely. We will not be responsible for any injuries that you cause to yourself or others if you fail to follow the guidance provided on the PT Online Service or otherwise act negligently when doing the exercises in the workout plan provided to you by PT Online. This document and any documents referred to within it (collectively, the “Terms and Conditions“) set out the terms of your relationship with us. It is important that you read and understand these Terms and Conditions before using the PT Online Service. By accessing and using the PT Online Service, you agree to these Terms and Conditions. If you do not agree to these Terms and Conditions, please do not access or use the PT Online Service. Personal Trainer Nordic Online AB is a company registered in Sweden, with its registered address at c/o Liljefors, Grundtvigsgatan 39, 168 48 Bromma. Please note that the PT Online Service provides you with exercise plans and tips which is based on the information you submit to us. In order to get the most out of the PT Online Service, you should ensure that (and you are responsible for ensuring that) any information you provide to us is accurate. The PT Online Service allows you to tailor exercise plans to your goals and ability, and to access and view instructional text and videos to assist you with completing the relevant exercises, as well as content relating to healthy eating and diet plans. People respond differently to exercise, and so we are unable to guarantee that you will see any change in your health, fitness, strength, ability, size or weight as a result of doing the exercises suggested to you through the PT Online Service. We will not be responsible to you if you do not achieve your exercise or fitness goals through using the PT Online Service. We may, from time to time, provide social features on the PT Online Service, which enable you to message and share information about your use of the PT Online Service with other users and upload video suggestions for new exercises. Any use of these social features should comply with our Rules of Acceptable Use below. To access the PT Online Service, you must download the PT Online App on your device and set up an account using your email address (your “Account“). You will need to create a password for your Account – we encourage you to use “strong” passwords (passwords that use a combination of upper and lower case letters, numbers and symbols) with your Account. You must be 18 years or older and capable in your country of residence of entering into a legally binding agreement to use the PT Online Service. You are responsible for maintaining the confidentiality of your login details and for any activities that occur under your Account. If you have any concerns that your Account may have been misused, you should contact us at info@ptonline.app straight away to let us know. The materials and content comprising the PT Online Service belong to us or our third party licensors, and we give you permission to use these materials and content for the sole purpose of using the PT Online Service in accordance with these Terms and Conditions. Your right to use the PT Online Service is personal to you and you are not allowed to give this right to any other person. Your right to use the PT Online Service does not stop us from giving other people the right to use the PT Online Service. not to look for or access the code of the PT Online App or any other portion of the PT Online Service that we have not expressly published publicly for general use. You agree that all confidential information, copyright and other intellectual property rights in the PT Online App or any other portion of the PT Online Service belong to us or the people who have licenced those rights to us. You agree that you have no rights in or to the PT Online App or any other portion of the PT Online Service other than the right to use and access them in accordance with these Terms and Conditions. We offer a free trial of the PT Online Service for 14 days after you have created your Account (the “Trial Period“). During the Trial Period, we will not charge you any fees for using the PT Online Service. On the day after the Trial Period ends you will be presented with alternatives for subscribing to the PT Online Service. A subscription is required for you to continue using the PT Online Service after the Trial Period has expired. After the end of the Trial Period, we will charge you a regular fee in advance for using the PT Online Service, as provided to you when you subscribe for the PT Online Service (the “Fee“). When you subscribe to the PT Online Service, you will need to select the length of your initial subscription (the “Subscription Period“). You authorise us to charge the applicable Fee for the selected Subscription Period to the Apple App Store account or other Distribution Platform account linked to your device. You confirm that you have the right to use the relevant account to make purchases on your device. Once your initial Subscription Period expires, your subscription will automatically renew for a further Subscription Period and we will charge you the applicable Fee for that Subscription Period. If you do not want to renew your subscription, you will need to tell us at least 24 hours before the next Subscription Period begins through the appropriate settings on your device, Apple App Store account or other Distribution Platform account. This paragraph 11 applies where the PT Online App has been downloaded from the Apple App Store. You acknowledge and agree that these Terms and Conditions are solely between you and PT Online, not Apple, Inc. (“Apple“) and that Apple has no responsibility for the PT Online App or content thereof. Your use of the PT Online App must comply with the App Store Terms of Service. You acknowledge that Apple has no obligation whatsoever to furnish any maintenance and support services with respect to the PT Online App. In the event of any failure of the PT Online App to conform to any applicable warranty, you may notify Apple, and Apple will refund the purchase price for the PT Online App to you; to the maximum extent permitted by applicable law, Apple will have no other warranty obligation whatsoever with respect to the PT Online App, and any other claims, losses, liabilities, damages, costs or expenses attributable to any failure to conform to any warranty will be solely governed by these Terms and Conditions and any law applicable to PT Online as provider of the PT Online App. You acknowledge that Apple is not responsible for addressing any claims of you or any third party relating to the PT Online App or your possession and/or use of the PT Online App, including, but not limited to: (i) product liability claims; (ii) any claim that the PT Online App fails to conform to any applicable legal or regulatory requirement; and (iii) claims arising under consumer protection or similar legislation; and all such claims are governed solely by these Terms and Conditions and any law applicable to PT Online as provider of the software. You acknowledge that, in the event of any third party claim that the PT Online App or your possession and use of that PT Online App infringes that third party’s intellectual property rights, PT Online, not Apple, will be solely responsible for the investigation, defence, settlement and discharge of any such intellectual property infringement claim to the extent required by these Terms and Conditions. You represent and warrant that (i) you are not located in a country that is subject to U.S. Government embargo, or that has been designated by the U.S. Government as a “terrorist supporting” country; and (ii) you are not listed on any U.S. Government list of prohibited or restricted parties. You and PT Online acknowledge and agree that Apple, and Apple’s subsidiaries, are third-party beneficiaries of these Terms and Conditions as relates to your licence of the PT Online App, and that, upon your acceptance of the terms and conditions of these Terms and Conditions, Apple will have the right (and will be deemed to have accepted the right) to enforce these Terms and Conditions as relates to your licence of the PT Online App against you as a third-party beneficiary thereof. you acknowledge and agree that the Store Provider is a third-party beneficiary to these Terms and Conditions as it relates to the PT Online App. You confirm that any images, text or information that you upload to the PT Online Service (your “User Content“) will meet the Rules of Acceptable Use. We do not claim ownership of your User Content, and ownership will remain with you and any third party whose content you include in your User Content. Instead, you grant us a worldwide, non-exclusive, royalty-free and perpetual licence to use, copy, reproduce, distribute, adapt, re-format, modify, publish, translate, license, sub-license and otherwise make available the User Content anywhere and in any form for the purposes of providing the PT Online Service (including allowing users that you give access to any User Content to view and use your User Content). In addition to the other requirements within these Terms and Conditions, this section describes specific rules that apply to your use of the PT Online Service (the “Rules of Acceptable Use“). use any automated system, including without limitation “robots”, “spiders” or “offline readers” to access the PT Online Service in a manner that send more request messages to the PT Online Service than a human can reasonably produce in the same period of time. The responses described in paragraph 14.3 are not limited, and we may take any other action we reasonably deem appropriate. If at any time you do not feel that you can agree to these Terms and Conditions or any changes made to these Terms and Conditions or the PT Online Service, you must immediately stop using the PT Online Service. Deleting the PT Online App might not close any Account you have created in relation to the PT Online Service. You must notify us if you wish to close your Account, and we will end your use of the PT Online Service and close your Account at the end of the Subscription Period in which you notify us that you would like to close your Account and stop using the PT Online Service, provided that you tell us at 24 hours before the then current Subscription Period expires. You can do this through the appropriate settings on your device, Apple App Store account or other Distribution Platform account. We may immediately end your use of the PT Online Service if you break the Rules of Acceptable Use, any other important rule(s), or terms and conditions we set for accessing and using the PT Online Service including these Terms and Conditions. Please note that we will not refund you any Fees that you have already paid in respect of the Subscription Period in which we end your use of the PT Online Service in this way. We may also withdraw any part of the PT Online Service as long as we give you reasonable notice that we plan to do this. If you or we end your use of the PT Online Service or we withdraw PT Online Service as described in this section, we may delete your User Content, any other information that you have uploaded to the PT Online Service or any other information we hold about you. You will also lose any rights you have to use the PT Online Service or to access our content or your User Content. You should therefore ensure that you keep a copy of any information or content you use on the PT Online Service, as well as your User Content, as we will not offer you compensation for any losses you might suffer if you lose your rights to access and use the PT Online Service or any such information, content or User Content. The termination of your use of the PT Online Service and the cancellation of your Account shall not affect any of your obligations to pay any sums due to us. Nothing in this paragraph 16 affects any legal rights you may have under the law of the country in which you are resident. While we will do our best to ensure that the PT Online App itself is of a reasonable standard and quality and matches any descriptions we have provided you, the PT Online App and any other portion of the PT Online Service may contain some content owned or developed by third parties. As we do not own or produce such third party content, we cannot be responsible for it in any way. In addition, due to the nature of the Internet and technology, the PT Online Service is unfortunately provided on an “as available” and “as is” basis. This means that we are unable to promise that your use of the PT Online Service will be uninterrupted, without delays, error-free or meet your expectations and we do not give any commitment relating to the performance or availability of the PT Online Service in these Terms and Conditions and, to the extent we are able to do so, we exclude any commitments that may be implied by law. In the event of a claim arising out of the provision of the PT Online Service, our responsibility to you will never be more than the amount you have paid us in the 12 months prior to the claim arising and, in the event that you have not paid us any money, we shall have no responsibility whatsoever to you. The above does not affect your rights under the applicable law of the country in which you are resident, including our responsibility to you for any personal injury or death caused by our negligence. If you have a dispute with us relating to the PT Online Service, in the first instance please contact us at info@ptonline.app and attempt to resolve the dispute with us informally. We are constantly updating and improving the PT Online Service to try and find ways to provide you with new and innovative features and services. Improvements and updates are also made to reflect changing technologies, tastes, behaviours and the way people use the Internet and the PT Online Service. In order to do this, we may need to update, reset, stop offering and/or supporting a particular part of the PT Online Service, or feature relating to the PT Online Service (“changes to the PT Online Service“). These changes to the PT Online Service may affect your past activities on the PT Online Service, features that you use, your User Content and any other information you submit to the PT Online Service (“Service Elements“). Any changes to the PT Online Service could involve your Service Elements being deleted or reset. You agree that a key characteristic of the PT Online Service is that changes to the PT Online Service will take place over time and this is an important basis on which we grant you access to the PT Online Service. Once we have made changes to any part of the PT Online Service, your continued use of the PT Online Service will show that you have accepted any changes to the PT Online Service. You are always free to stop using the PT Online Service. We may revise these Terms and Conditions from time to time but the most current version will always be at https://www.ptonline.app/terms-and-conditions/ or in the relevant section of the PT Online App. Changes will usually occur because of new features being added to the PT Online Service, changes in the law or where we need to clarify our position on something. The current version of these Terms and Conditions contains the only terms and conditions that apply to our relationship with you. We intend to rely on these Terms and Conditions as setting out the written terms of our agreement with you for the provision of the PT Online Service. If part of these Terms and Conditions cannot be enforced then the remainder of these Terms and Conditions will still apply to our relationship. If you do not comply with these Terms and Conditions and we do not take action immediately, this does not mean we have given up any right we have and we may still take action in the future. English law will apply to all disputes and the interpretation of these Terms and Conditions. If we need to apply to court to enforce any part of these Terms and Conditions against you or resolve any other dispute between us arising from or related to your use of the PT Online Service, we will initially seek to apply to the English courts. This does not affect your rights under the law of the country in which you are resident, including your right to have a dispute in relation to your use of the PT Online Service heard in the courts of that country. If you need to contact us in relation to these Terms and Conditions or any other document mentioned in them, please email us at info@ptonline.app. We value hearing from our users, and are always interested in learning about ways we can improve the PT Online Service. By providing your feedback you agree that you are giving up any rights you have in your feedback so that we may use and allow others to use it without any restriction and without any payment to you.